cloaked in spanish moss, originally uploaded by DanielJames. 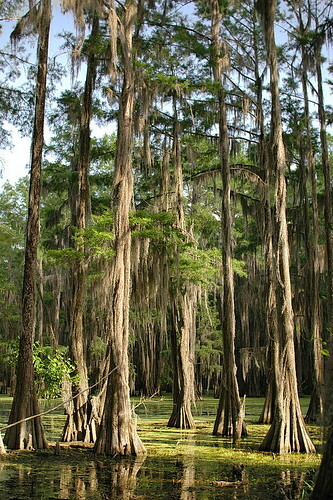 Cypress trees in the Big Cypress Bayou near Karnack, Texas. This does not look like the kind of place where you would want to go for a dip. Looks actually like the kind of place where you might find all sorts of slithering, snaping, creeping, biting and otherwise not very friendly criters.